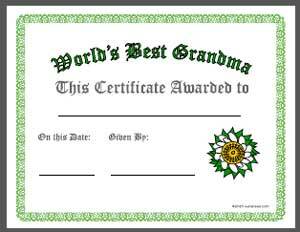 Any grandmother will be overjoyed on Mother's Day, her birthday or perhaps Christmas when you give her a personalized World's Best Grandma certificate decorated with a a lovely border and flower. All you need to add are the personal details. Each Adobe PDF best grandma certificate is designed to print on US letter size paper (8.5" x 11") in landscape mode, but any of the awards can be resized to fit your own paper or design ideas.